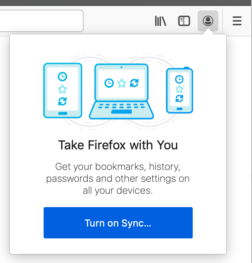 Over the past few months the Firefox Accounts team have been working on making users more aware of Firefox Account and the benefits of having an account. This phase had an emphasis on our desktop users because we believe that would have the highest impact. 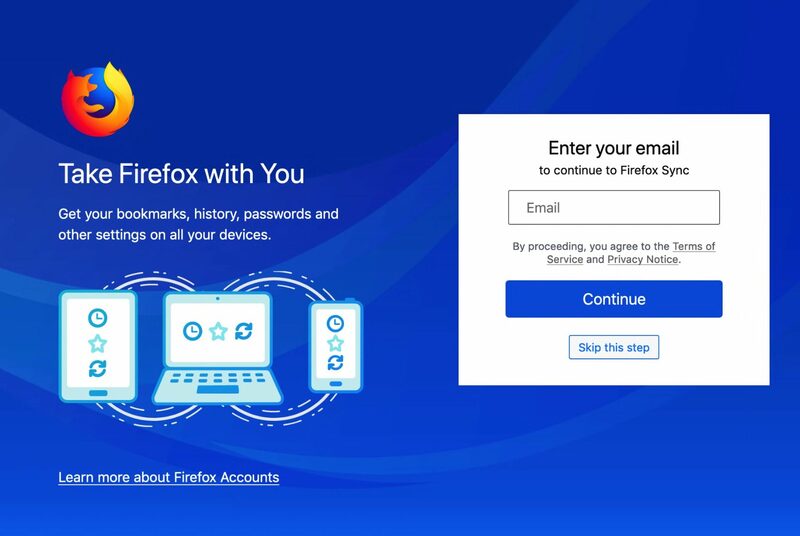 Based on user testing and feedback, most of our users did not clearly understand all of the advantages of having a Firefox Account. Most users failed to understand the value proposition of an account and why they should create one. Additionally, if they had an account, users were not always aware of the current signed in status in the browser. This meant that users could be syncing their private data and not fully aware they were doing that. 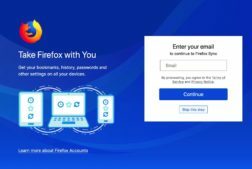 If a user failed to create an account and login during the first two points, it was very unlikely that they would organically discover Firefox Accounts at point three. Having only these touch points meant that users could not always set-up a Firefox Account at their own pace. Our team decided that we needed to make this easier and solicited input from our Growth and Marketing teams, particularly on how to best showcase and highlight our features. 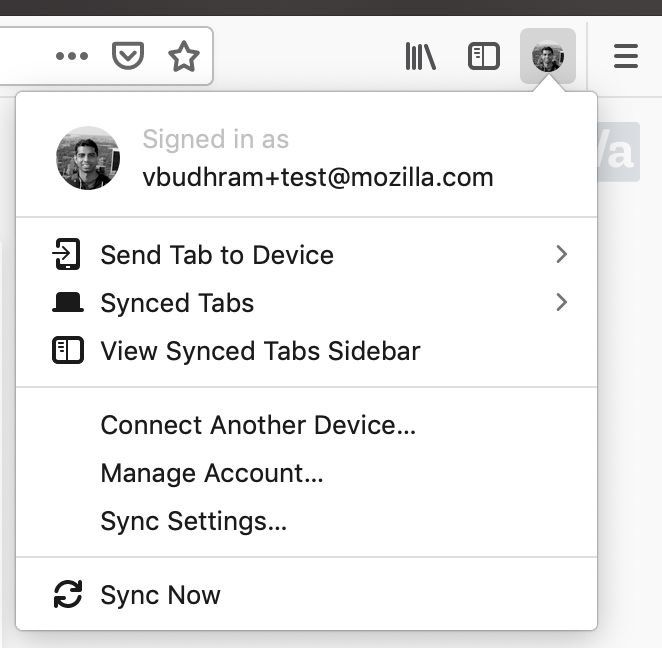 From these discussions, we decided to experiment with putting a top level account menu item next to the Firefox application menu. Our hypothesis was that having a top level menu would drive engagement and reinforce the benefits of Firefox Accounts. We believed that having an account menu item at this location would give users more visibility into their account status and allow them to quickly manage it. 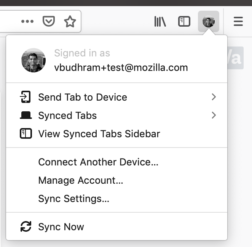 While most browsers have some form of a top level account menu, we decided to experiment with the feature because Firefox users are more privacy focused and might not behave as other browser users. The initial designs for this experiment had a toolbar menu left of the Firefox application menu. This menu could not be removed and was always fixed. After consulting with engineering teams, having a fixed menu could more easily be achieved as a native browser feature. 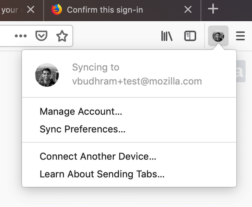 However, because of the development cycle of Firefox browser (new releases every 6 weeks), we would have to wait 6 weeks to test our experiment as a native feature. If the requirement that the menu was not fixed was lifted then we could ship a Shield web extension experiment and get results much more quickly (2-3 weeks). Shield experiments are not tied to a specific Firefox release schedule and users can opt in and out of them. This means that Firefox can install shield experiments, run them and then uninstall them at the end of the experiment. After discussions with product and engineering teams, we decided to develop and ship the Shield web extension experiment (with these known limitations) and while that experiment was gathering data, start development of the native browser version for the originally spec design. There was a consensus between product and engineering teams that if the experiment was successful, it should eventually live as a native feature in the browser and not as a web extension. The overall feedback for the top level menu was positive and most users were not bothered by it. Based on this we decided to update and iterate on the design for the final native browser version. 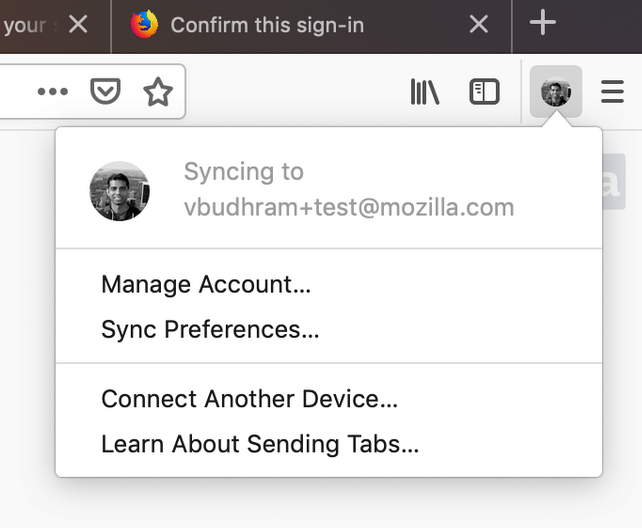 After discussing with team, while having this menu fixed was in the original designs, we decided to have it not fixed because that was what the experiment ran as and it was more inline with the Firefox brand of being personalizable. Because we started working on the native feature while the experiment was running, we did not have to dedicate as many development resources to complete new requirements. Check out the development bug here for more details. We are currently researching ways to best surface new account security features and services for Firefox Accounts using the new toolbar menu. Additionally, there are a handful of usability tweaks that we would like to add in future versions. Stay tuned! 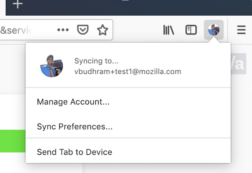 The Firefox Account toolbar menu will be available starting in desktop Firefox 67. 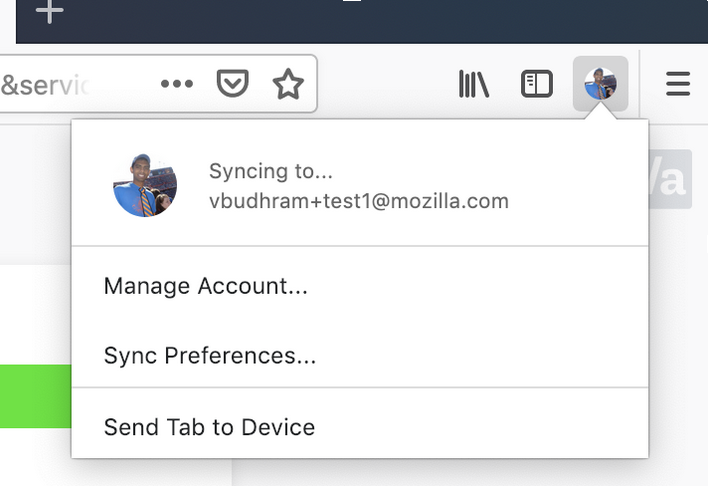 If you want to experiment early with it, you can download Firefox Beta 67 or Firefox Nightly. Big thank you for all the teams and folks that helped to make this feature happen!